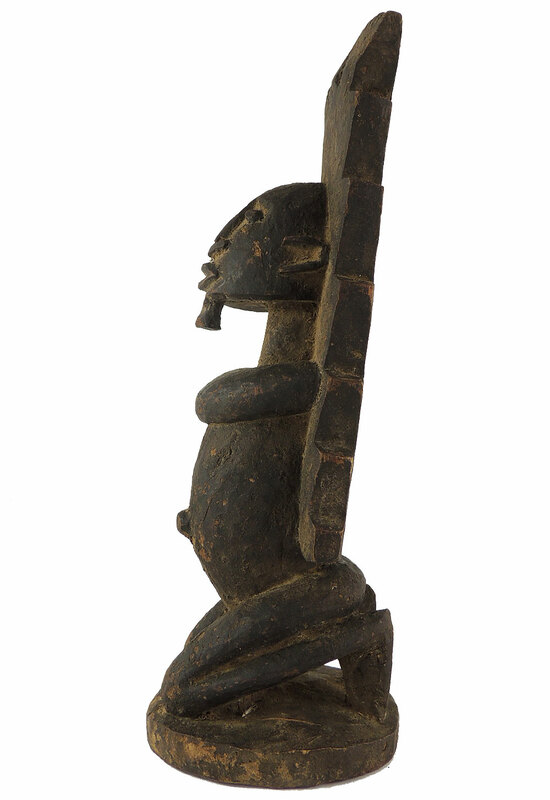 Additional Information: A superb Dogon figure standing with arms raised to the heavens in a "Tellem" position. 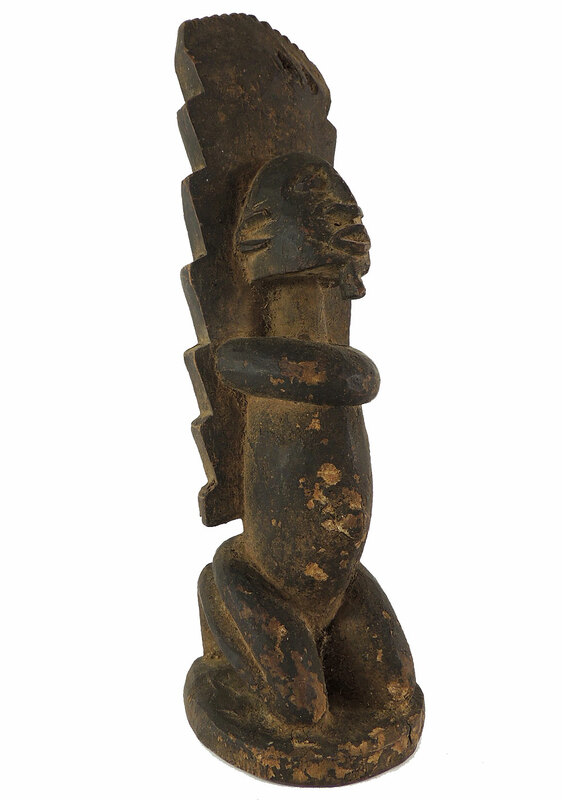 This standing figure portrays Tellem, ancient spirits that the Dogon venerate to bring rain to their dry land. The standing position of the figures with their arms upraised are said to be acting as intermediaries to deities for rain. These figures are modeled after much older figures found in the caves, where the Dogon buried their dead. The figure may represent an ancestor or equally a Nommo, one of the eight primordial figures created by God. He may have been placed on a family altar or kept in the village priest’s shrine where he would have offerings and sacrifices made upon her to infuse her with life force to assist humans on earth and to intercede with the deities. The offerings made over time have eroded and roughened the surface giving it an ageless presence. Around 1490, the Dogon fled the Mossi cavalry and its Islamic theology, settling in the imposing cliffs of Bandiagara, the land of the Tellem. As more Dogon migrated into the area, they absorbed the Tellem into their culture. In the process, there emerged what is recognized today as the "Dogon style." There are numerous theories about the meaning of these statues, from a "prayer for rain," to less specific ones, with the statue serving as a priestly intermediary for ancestral contact. Like most Dogon art, its true meaning is shrouded in myth. The Dogon, numbering around a quarter of a million, are one of most remarkable cultures in the world. 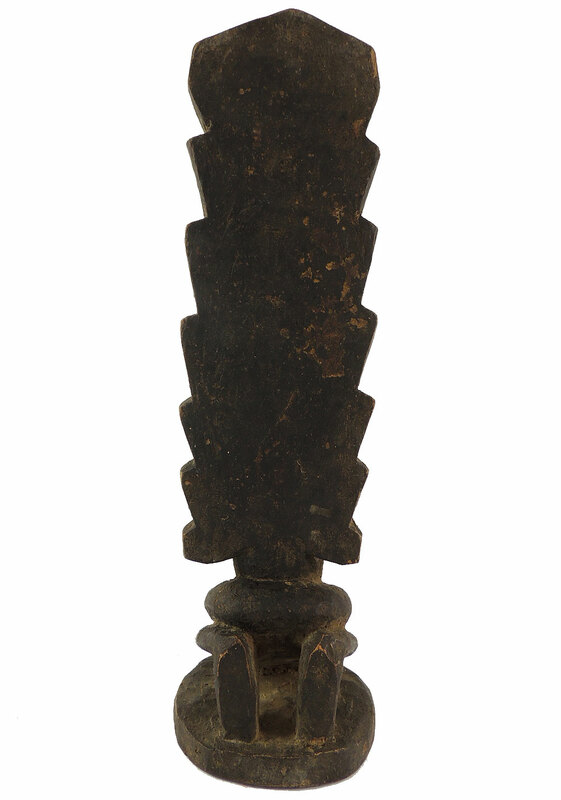 Due to centuries of cultural isolation, Dogon art remains remarkably unaffected. They have become a laboratory, of sorts, for ethnologists. They are a very hospitable people, much to the relief of the scholars and journalists who have intruded upon them. Though they occasionally perform dances for visitors, they carefully guard the majority of their ritual and artistic traditions. The enduring fascination with the Dogon shows no signs of abatement. Recommended Reading: See Laude's AFRICAN ART OF THE DOGON.